With all the chaos of having a new baby in the house, I have kind of ignored the fact that I turned twenty-nine last Friday. I'm officially in the last year of my twenties. How do I feel about this? I'm really okay with it, I feel like I am in really good place in my life. I am married to a great guy who I've been with almost 11 years, I have two beautiful and healthy little girls, I own a home and a car and most importantly I have the privileged of being able to stay at home with my children while they are little. Sure there are things that my younger self would have wanted to or thought I would have accomplished by now but I'm pretty sure that nearly everyone is in that boat. There are important things such as graduating from college, which I still kick myself for and can't believe how much time and money I wasted by not earning my degree. There are also superficial things like wanting to have the body of fitness model, keeping my smile whiter and learning how to make my hair look good in Florida's humidity. Then there are less important silly things like being able to sew clothes or having all my pictures organized into beautiful albums. Hopefully I can continue to work on checking all of those things off of my list of life goals in the future. So what do I want to focus on in the last year of my twenties? I really want to start making a valiant effort into becoming someone that my girls can look up to and admire. Don't get me wrong, I'm pretty great now but there is definitely room for improvement. The two main things that I believe will get me to the next level are getting back down to a weight where I feel comfortable in my skin again and to have a more positive outlook on everything that comes my way. The weight loss thing is because I feel like one of the most important trait in life is confidence. If you aren't confident in yourself than life is a lot harder to live. Since gaining weight over the past few years, my confidence in myself has dwindled and I really feel like it's important to get that back. As for positivity, I tend to always go to the negative part of my brain instead of the positive. Obviously it would benefit everyone in my life if I stopped doing this. Plus being negative is really just a waste of time and energy. So basically I plan on being ridiculously awesome by the time I hit the big 3-0. I think you're ridiculously awesome now! Happy Birthday!! 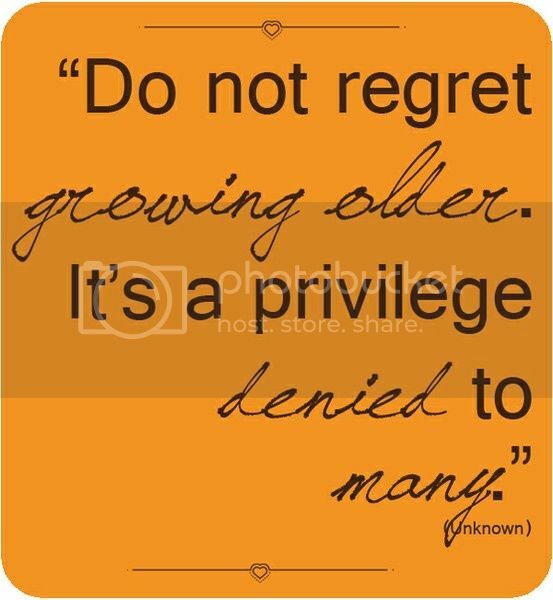 I've never regretted or hated turning a year older - for that exact reason! It's a privilege to turn 1 year older! Better that than the opposite...I almost have 6 months left in my twenties...bring it on 30's and happy belated! Happy belated Birthday. I have one more yr in my twenties. I turn 29 in October. I enjoyed reading this. Happy belated birthday, mama! And I love this quote. I need to remember it when I'm feeling old.